Representational State Transfer (REST) as an architectural style for service design has seen substantial uptake in the past years. 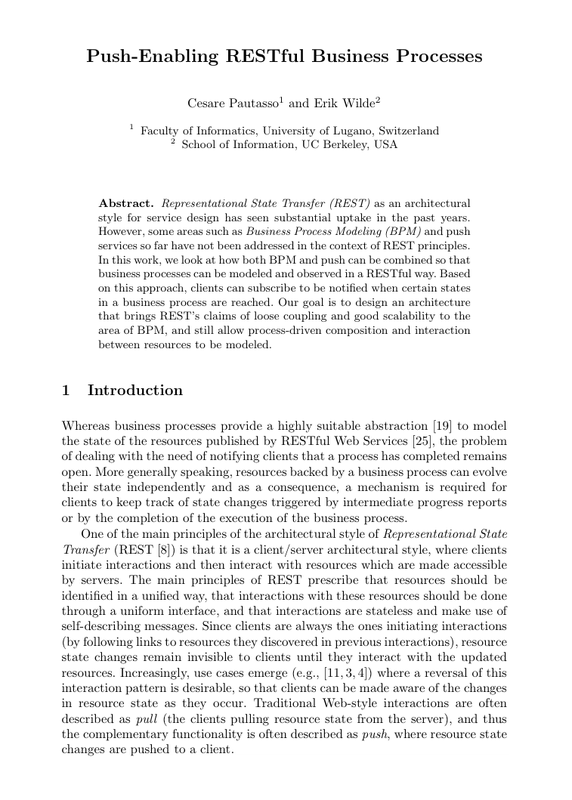 However, some areas such as Business Process Modeling (BPM) and push services so far have not been addressed in the context of REST principles. In this work, we look at how both BPM and push can be combined so that business processes can be modeled and observed in a RESTful way. Based on this approach, clients can subscribe to be notified when certain states in a business process are reached. Our goal is to design an architecture that brings REST’s claims of loose coupling and good scalability to the area of BPM, and still allow process-driven composition and interaction between resources to be modeled.